A few pictures of a new commissioned art quilt I’m working on for a very sweet customer. This is her 2nd commissioned order and we’re planning a third. 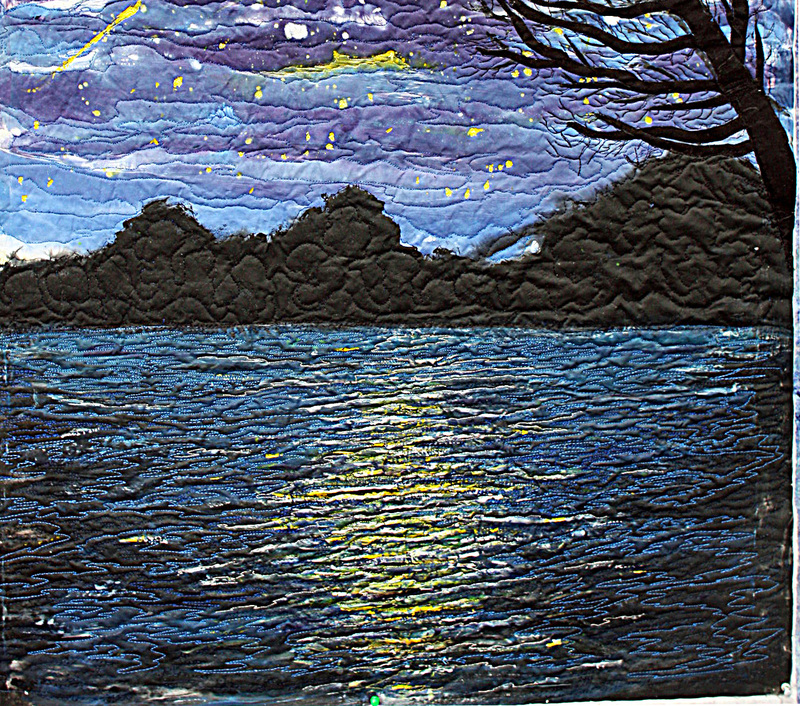 I love commissions, customers come up with ideas for quilts that never occurred to me. It is fun to get a fresh perspective and to run with their idea and make it happen. 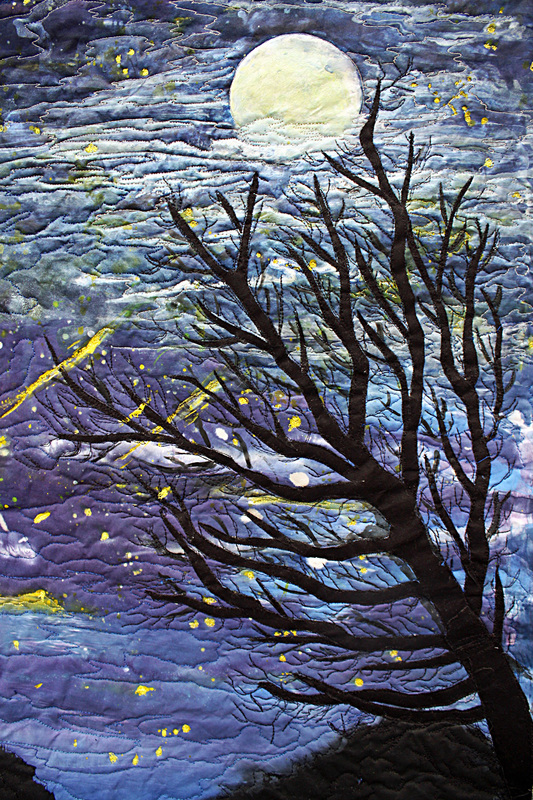 Many of my favorite quilts have been commissioned ones. 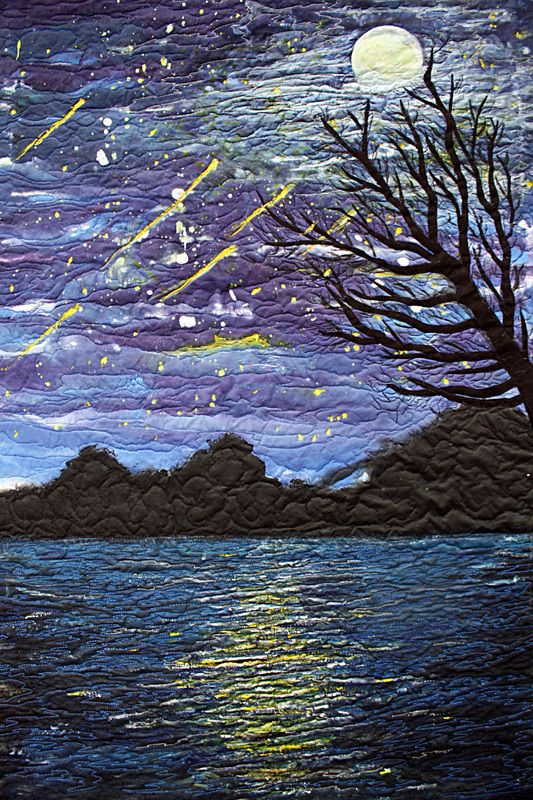 This one is no exception, she wanted a starry night sky. I would not have thought of that, but it was the funnest quilt to work on. Here’s some pictures of the almost finished quilt. I do commissions and could make something custum in a simular vein for you. Calling All quilters Who Hate Binding Their Quilt's. Usually available. Leave me a message I'll get back to you promptly. or it won't be opened. My Posts By Catagory Select Category A Bit Of Fun From the Past abstract & geometric Abstract and Geometric quilts Archeives art work Available Work Blog posts Contact Decorate On A Dime Decorate Your World Decorating with style Entertain in style Events famous quilters Galleries Gallery-Overview of my work Home Home and Garden In Progress inexpensive art quilt Inexpensive art quilts,, Inspire! Internet Interviews 1 Interviews 2 Interviews number one 1 Interviews number two Interviews-1 Interviews-2 Just Fun landscape Landscape Gallery Misl Nature Gallery Nature Quilts New quilts News Older Posts- Original art low price PHOTOGRAPHY Photography a Door To Ceativity Recent Posts shop Silk Paintings Starts & Finishes Stylized Floral Gallery Stylized Flowers Art Quilts stylized nature stylized nature The Garden The internet The internet, A Shrinking World and connecting Hollyhock Lovers Everywhere! This & Thàt This and That Tutorials Uncategorized Uncategorized. What”s New? What’s new? Abstract and Geometric quilts Archeives Blog posts Decorate On A Dime Decorate Your World Decorating with style famous quilters In Progress Inspire! Interviews-2 Interviews 2 Just Fun Misl Nature Gallery Nature Quilts New quilts Older Posts- PHOTOGRAPHY Recent Posts Silk Paintings Stylized Floral Gallery Stylized Flowers Art Quilts stylized nature The internet This & Thàt This and That Tutorials Uncategorized Uncategorized. What"s New? 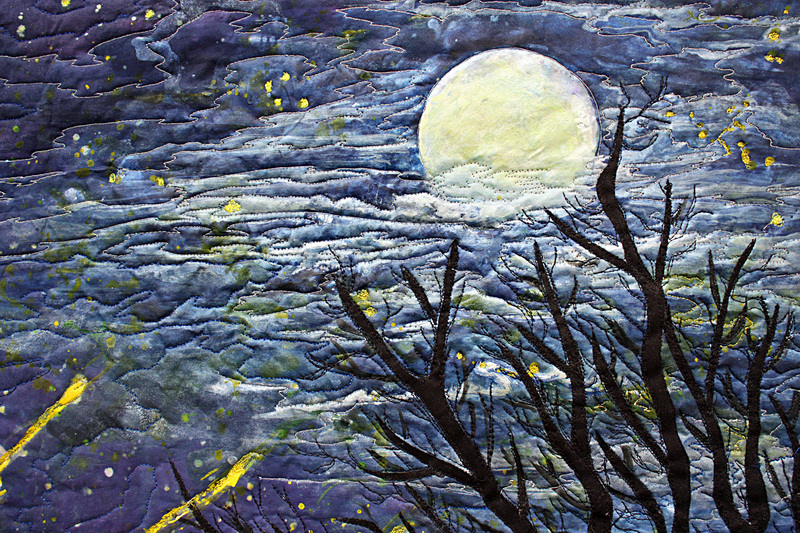 "Why is it that Barbara Harms- Barbara Harms, Up Close and Personal I'm a fiber quilt artist, working in mixed media . My family is filled with artists & I inherited an aptitude for art. By my teens I had narrowed my focus to painting. I joined the Las Vegas Artist's Guild, their youngest member at the time. I was totally out of my league, a teen, in a room of adults. Mute, taking it all in. I hoped I went unnoticed, a fly on the wall, unlikely. A silent teenager in their midst, I’m pretty sure they noticed. But being emerged in art, exposed to serious artists, was a great experience. I’ve painted for most of my life. So, there you have it, the "glorious" beginnings of my artistic "career"! I've continued to paint for most of my life. I was introduced to quilting after moving to Oregon & instantly in love. It was new & exciting, I jumped in. 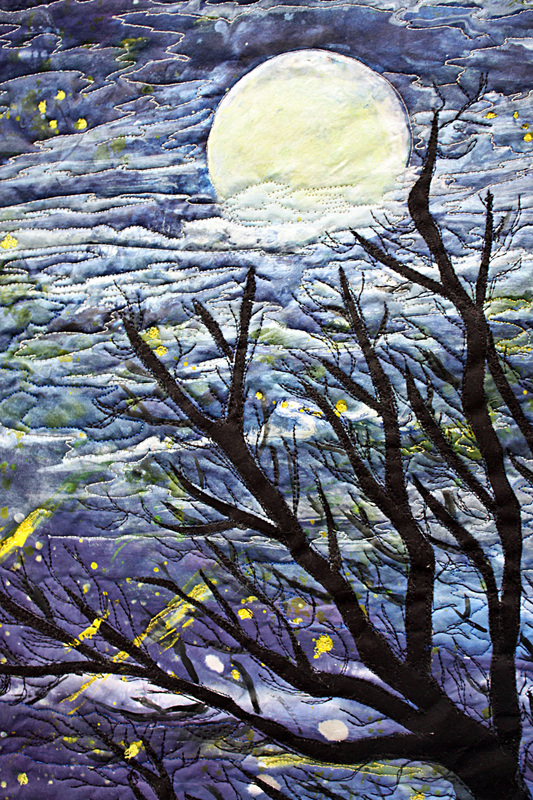 As enjoyable as I found quilting, I began to missed painting, Then, I discovered fiber art quilting, I was finally home. My Process & Approach For me, it's the process of creating that holds the strongest attraction. I love starting with a tiny seed of an idea; vague and blurred around the edges, then I follow where it leads. My style is fairly loose and instinctual. The choices and decisions that come up as I work on a piece, are made based on my gut feelings. This can result in quite a few changes in direction. This approach can lead to many changes in the direction. it takes The outcome can come as a surprise. I love that element of surprise. Sometimes everything just comes together & I think that this is one of my better ones. I can’t wait to show someone. I feel like a six year old, running home from school, a drawing in hand. He can't wait to show Mom. At those times I'm smiling like the Cheshire cat. My Etsy shop, where my work can be purchased. 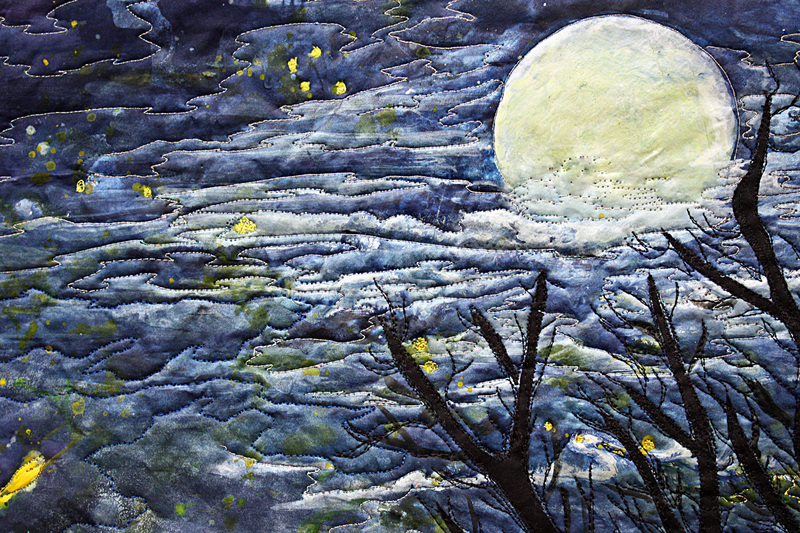 My Wordpress blog, Galleries of current and past work displayed, interviews with well artists and quilters and more. in the field. Catagories Select Category A Bit Of Fun From the Past abstract & geometric Abstract and Geometric quilts Archeives art work Available Work Blog posts Contact Decorate On A Dime Decorate Your World Decorating with style Entertain in style Events famous quilters Galleries Gallery-Overview of my work Home Home and Garden In Progress inexpensive art quilt Inexpensive art quilts,, Inspire! Internet Interviews 1 Interviews 2 Interviews number one 1 Interviews number two Interviews-1 Interviews-2 Just Fun landscape Landscape Gallery Misl Nature Gallery Nature Quilts New quilts News Older Posts- Original art low price PHOTOGRAPHY Photography a Door To Ceativity Recent Posts shop Silk Paintings Starts & Finishes Stylized Floral Gallery Stylized Flowers Art Quilts stylized nature stylized nature The Garden The internet The internet, A Shrinking World and connecting Hollyhock Lovers Everywhere! This & Thàt This and That Tutorials Uncategorized Uncategorized. What”s New? What’s new? The internet, A Shrinking World and connecting Hollyhock Lovers Everywhere!